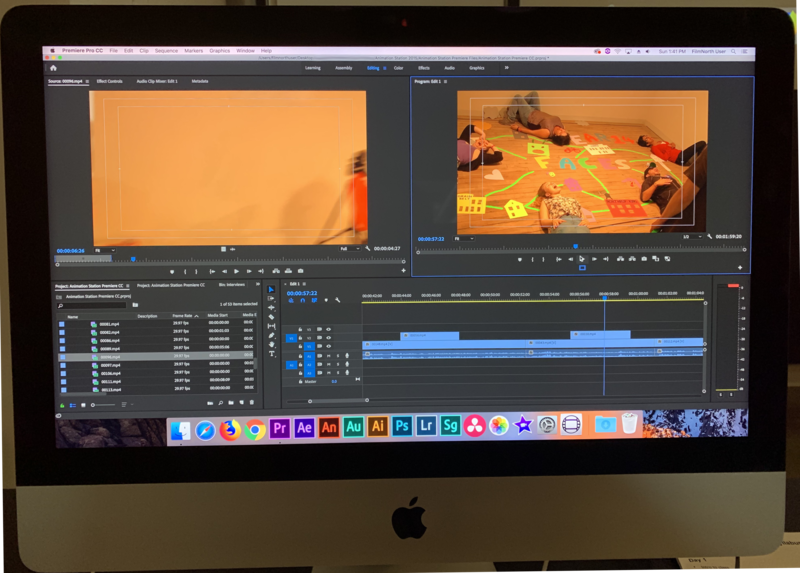 In January 2019, I attended a beginner’s workshop in Adobe Premiere presented by Beth Perloff at Film North in St. Paul, Minnesota. The following post brings together 11 takeaways from that two-day workshop. 1. Everything in its place. In other words, keep all the materials — video, music, effects, titles — organized. This one feels like the first rule of the editors’ fight club. 2. Editors are Zen masters. Editing is not for the impatient or the distracted. Though some may possess the ability to edit quickly, editing requires zen-like attention to details and laser-focused concentration. Distractions such as phone notifications only break concentration and extend the project’s editing time, which is going to be a while no matter how long the final cut’s runtime. 3. Know the footage you are working with. Both of the projects we completed for this session involved editing other people’s footage. Coming in to this footage cold felt like a disadvantage, though to be fair, it was a necessary reality of the class. Editors should be involved with projects early in their developmental phases, and they should be familiar with the “big picture” (sorry) goals and the footage available. 4. The granular level of editing is kind of fun. Putting together all the pieces reminded me of building with a Lego set. Not a Lego set with a finished picture on the package and instructions inside, but the Lego bucket with the tons of pieces inside and not a direction in sight. 5. Continuity editing is hard. One of the projects assigned in this workshop was editing a low-budget zombie feature. The instructor provided directions on what images should appear in what order, but we still had to edit the shots and situate them within the timeline. All it took to mess up continuity was 1-2 seconds of extra footage. That extra footage created jump cuts and flow problems. I also learned that my editing tends to run long — probably part of the transition from working with words to working with images. I am still learning how to think visually. 6. Editing from paper makes the process easier. Arranging the images and sequences on paper before assembling them in the non-linear video editor makes the process go much faster. Storyboards are a key part of the production process in fiction production; they also can help with the editing in post-production. 7. Sound provides powerful cues when used well. We tend to think of tethering sound to its synchronous image, but freeing sounds from that connection creates multiple possibilities for storytelling. The easiest example comes from the zombie film we worked on in the class: the girl cowering in the hallway said nothing, but adding the zombie moans and groans to the soundtrack turns that shot into something that builds suspense. In documentary this practice generally is more prominent, such as interview participants being heard on the soundtrack before appearing on screen. Audio transitions, such as a piece of dialog, can mask problems of two different sounds from one interview to the next. 8. Sounds requires a lot of fidgeting. Sound includes dialogue, music, and sound effects. The chance that all of those occur at the same volume and with the same quality is small. Music might come in quite loud, while effects might come in too soft. Dialogue — any spoken words — usually take priority and should be louder than the background music or the effects. A range of 12-18 works best, with the loudest moments hitting 6 at most. But, stay away from zero. 9. Documentary editing is awesome. Perhaps to no one’s surprise, I really enjoyed the documentary editing part, which served as the second day’s project. This time we were given the footage and not told how to arrange it. Interviews play a huge role in documentaries, which often consist of multiple, intercut voices used in developing and telling the story. The general advice includes to keep the sound bites short and also to take care to preserve the integrity of what they say. 10. Subtractive editing or assemble editing? Subtractive editing consists of assembling the shots into the timeline and then shaving down the unneeded parts toward a rough cut and then a finer cut. I struggled with this approach because I find it easier to edit the shots I would like before adding them to the sequence, which sounds a bit like assemble editing or a version of it. 11. Learning film criticism is necessary for anyone learning film production. This introductory editing course is my fifth course through Film North. Each one has reminded me the importance of film criticism, which includes both formal readings but also more cultural readings of films. The criticism background helped with knowing many of the technical terms these artists use in their craft, such as fades and wipes in editing and key, back, and fill lights in cinematography. But this criticism also reminds of the power behind these practices. Editing, in particular, holds a lot of power in how it can remove sentences, words, and emotional reactions from interviews. It holds power in ordering voices; who speaks first sets tone for a documentary, for example. It further holds power in frequency of those voices; who speaks most generally holds the greatest authority. Just look at the editing of Ken Burns’s The Civil War and how often Shelby Foote appears versus Barbara Fields for an example.